This post is my contribution to #LetsLunch, a monthly virtual potluck on Twitter. This month’s theme is “pie” and his hosted by my friend, Lucy Mercer, at A Cook and Her Books. 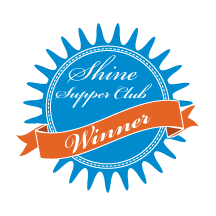 Please visit Lucy’s blog for lots of wonderful stories and recipes. When I was a kid, one of my favorite after-school treats from the cookie bin at the local farm stand were those windmill cookies, modeled after Dutch speculoos cookies. Years later, I ran into a more refined version of them, disguised in a non-windmill biscuit shape, as Biscoff cookies. Biscoff are from Belgium and were served initially only on select airlines, but are now widely available. They’re light and crisp, with a flavor like caramelized shortbread. Great with tea. Then a year or so ago, the unimaginable happened– Biscoff started to offer a cookie spread made out of Biscoff cookies, sugar and oil, to be enjoyed as you might peanut butter or Nutella. This is a sometimes-only treat around here, because of all that oil and sugar. 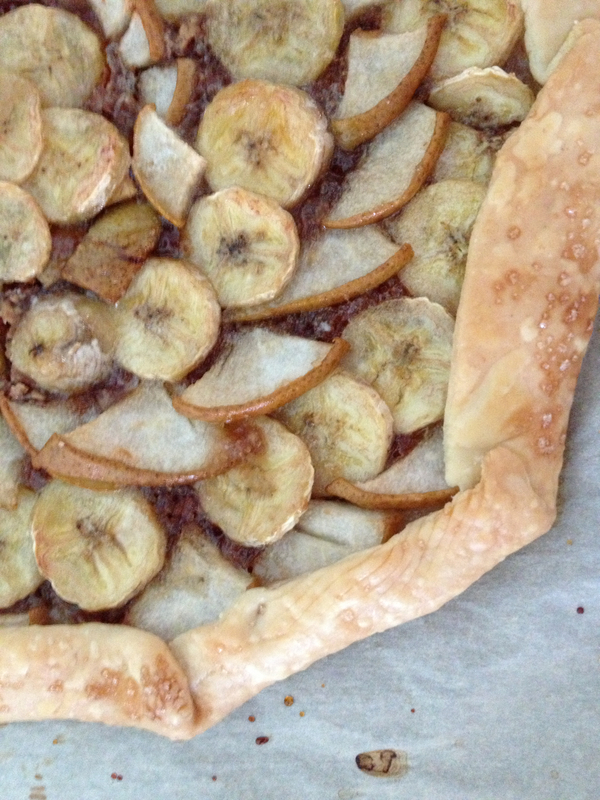 I needed to bring something to a potluck one day, saw the jar of Biscoff spread and thought about how good bananas and pears are caramelized and thought, why not combine all of these into a tart? So I went to my go-to tart/pie, the rustic galette, and came up with this recipe. Enjoy! Starting on the perimeter, arrange pear and banana slices on top of the Biscoff spread layer in alternating circles, prettily. Fold over the crust, overlapping in a few places, to form a rim for the galette. Leave all except for a bit of the outer ring of fruit uncovered. Sprinkle diced butter and sugar evenly over the fruit. Brush cold water onto the crust and then sprinkle a bit of sugar for sparkle. Bake for 25 to 30 minutes, until the crust is golden and filling is bubbly. Serve warm or at room temperature. Some vanilla ice cream would be a welcome addition. Thanks for coming by! If you enjoyed this, please leave a comment and/or share with your friends. And if you have another favorite recipe involving Biscoff cookies or spread, please share in the comments! You know, I only very recently discovered Speculoos — in Paris, via Let’s Lunch co-founder Cowgirl Chef! I have never baked with it though — this looks delicious! Thanks, Cheryl! I may need to return to Paris to get some Parisian speculoos. Pingback: Glass of Fancy » Blog Archive » Let’s Lunch: Chocolate Pie - Fashion, fiction, and life in the city. Yes, this is an easy recipe which tastes surprisingly complex. Hope you try it with your homemade Biscoff! We have a jar of Biscoff in our pantry, but I have no idea what to do with it. Your pie has inspired me…. Let me know how it turns out. I can also imagine it in a tart with some of your homemade chevre. Hi Lisa, great to see you here! 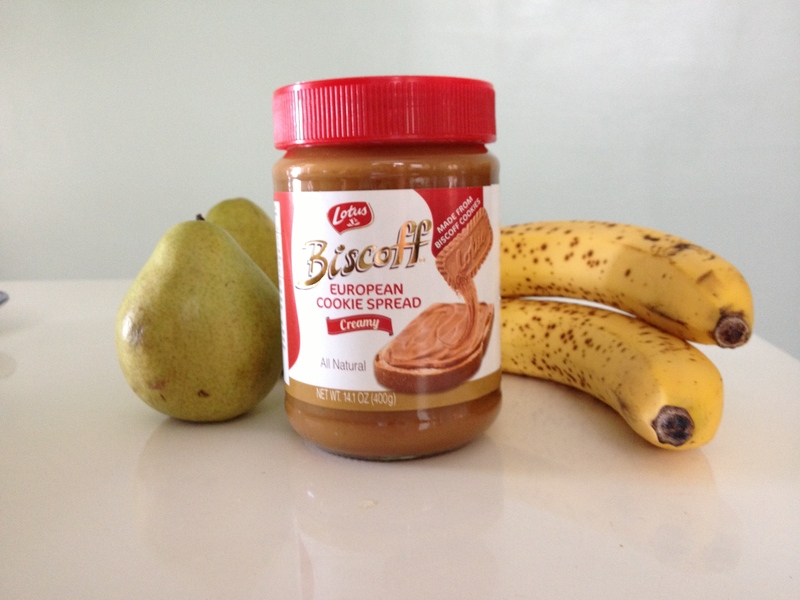 Biscoff spread is also excellent with sliced peaches, which I am sure you have plenty of where you are. Hi Lucy, thanks! What a wonderful #LetsLunch you’ve hosted. People really seem to love pit! I only just recently tried Biscoff, or rather the Trader Joe’s version of it. The description of cookie flavored spread didn’t sound appetizing, but after trying it, I can see the appeal. I sometimes spread it on slices of apple or pear. The galette looks like a creative use of it! I know, I think some better marketing is in order. I think of it as the cookie alternative to Nutella, not that there needs to be an alternative. I’ll have to try the TJ’s version to see how close it comes. This sounds delicious, I have never tried biscoff before, I think I am the only person who hasn’t had it. I have heard its really wonderful. Love the tart! Thank you! Apples could work really well, too, with the caramelly flavor of the Biscoff Spread.